MIC Q.A: Rapping his whole life, Mic Q.A has become a solid lyricist honing in on his craft. This makes his music honest and passionate but smooth to the ears. Q.A is from Minneapolis and enjoys performing at local venues in the Twin Cities. Q.A's most recent album,Black Gold, is a project which tells the story of Mic Q.A’s life; encapsulating the trials and tribulations of growing up, relationships, highs and lows, and everything in between. The writing process took situations from personal life and transformed them in to honest works of art. This album was created solely from personal experiences and Minneapolis influences making it an authentic collection of musical expression. Q.A is an emerging artist in the Twin Cities, he is consistently writing and recording new music, performing at local venues solo and with fellow artists in Mill City Collective, as well as appearing on local radio and events within the community. SIEED BROWN: Sieed Brown is an up and coming artist from Minneapolis, MN. His music can be described as relative, passionate hip-hop. His lyrics are honest, soulful, and true to his persona. As a Mill City Collective member Brown has been releasing music for a couple of years and there is no end in sight. Brown has new music on queue for late spring titled Ameliorate. GUANTE: Guante is an MC, two-time National Poetry Slam champion, activist, educator and writer. He and/or his work has appeared on Upworthy, MSNBC, Welcome to Night Vale, Racialicious, Feministing, MPR, Everyday Feminism, the Progressive, City Pages’ “Artists of the Year” list and URB Magazine’s “Next 1000” list, and he has performed everywhere from the United Nations to the Soundset hip hop festival to hundreds of colleges, clubs, and theaters across the country. Whether deconstructing traditional notions of masculinity, challenging dominant narratives related to race and racism, or just telling stories about the different jobs he’s had, Guante strives to push boundaries in terms of both form and substance. Unapologetically social justice-minded, he’s shared stages with artists like Talib Kweli, Saul Williams, Brother Ali, Dead Prez, Sage Francis, Andrea Gibson, and many more. Guante also serves as a teaching artist on the rosters of COMPAS and TruArtSpeaks (where he also serves as Communication Director), engaging in writing and performance residencies with youth, as well as regularly facilitating workshops and classes on a range of social justice issues. DIS-PLAY: Jabriel Suhail Abuhamed, better known as his stage name Dis-Play, is an American rapper, record producer and part of Minneapolis-based Hip Hop collective Lambs to Lions. Born and raised in Minneapolis, MN to a household with strong Islamic practices of love and acceptance but also being part of the 90s generation, taught to question authority, translates into his music. Following in the footsteps of Aesop Rock, Earl Sweatshirt, and Run The Jewels his aggressive style is a blend of highly personal alt-rap and morbid story telling that has come to be expected of his content. 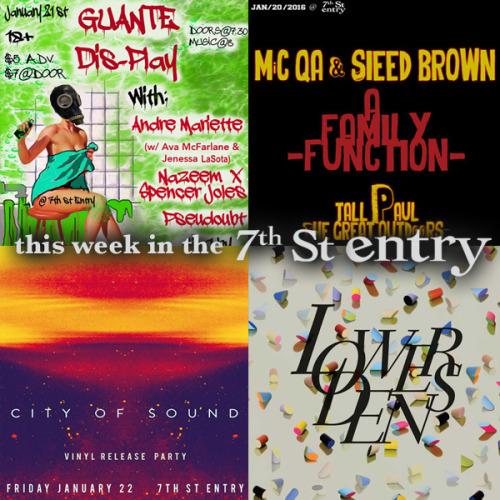 Currently Dis-Play is working with some of the Twin-Cities most notable rising stars such as Nazeem, Spencer Joles, Andre Mariette, Pseudoubt, Catalyst and Ackronem all while preparing to release his solo EP and group Lambs to Lions’ debut album. Since 2006, City of Sound has been through just about everything under the sun. From side projects to seizures... from drugs & alcohol to treatment... and finally a rebirth into something much more focused and meaningful. The band has put out two self-produced full lengths and now is releasing a six song EP that's chalked full of emotion and energy. The music was recorded live at the Terrarium on one frigid day in Minneapolis (2015). Rebirth is a nod to the band's past and a taste of what is yet to come. Lower Dens are a shoegaze band from Baltimore, Maryland that formed in 2010. On Escape from Evil (2015), Lower Dens’ Jana Hunter emerges: cerebral and hot-blooded, rash and incorruptible, and, crucially, possessing of a loud, clear voice. The album sees Hunter stepping up and taking center stage, and emboldening every aspect of the band. Lower Dens’ 2010 debut, Twin-Hand Movement, was a stunning evolution of guitar brilliance and murky emotiveness, while its 2012 follow-up, Nootropics, was a stark, textured paean to experimental bands of the krautrock era. Escape from Evil marks a bold, monumental step forward for the band and the welcome manifestation of a singer we’ve never quite seen until now.